What I am thinking about this morning is how difficult it is to find space to have deep thoughts sometimes. As an artistic director, our jobs are so multi-faceted and so busy. On Sunday night I got home late from the PACT conference, Monday morning I started rehearsals for Blithe Spirit, but before that, I had an interview on CBC, at lunch time I had meetings, after rehearsals I had an interview for a new staff member and after that meeting with my assistant director. I really love my job, I love how many different skills it takes to do it, but I am really looking forward to this thought residency to carve out space to think. This is Ashlie Corcoran with my second thought. Today we a started staging Noel Coward’s Blithe Spirit here at the Thousand Islands Playhouse. This is the first Noel Coward piece that I have directed and I am finding myself thinking about the usual suspects like action, and events and objectives, and I am also thinking a lot about style and etiquette, this is something I am really curious about and I look forward to learning more about it. This is Ashlie Corcoran and my third thought. When I’m directing I notice I am often obsessing about and thinking about the themes of the piece I’m directing, the ideas behind it, maybe the history. Sometimes that is an overt obsession and sometimes it’s more – um – subconscious. What I am noticing with Noel Coward’s Blithe Spirit is that my vocabulary has vastly improved. I am calling everything supercilious and also overpoweringly demure, hideous and facetious. I am enjoying this part of directing this piece. This is Ashlie with my fourth thought. One of my favourite parts of my job is how many decisions I both have to make and also get to make. This is right from the many detailed decisions that we’re making together in our rehearsal hall to the larger macro decisions about season programming and planning and artistic vision. I am so far into 2017 season planning that sometimes I am not even sure what year it is. 2016? 2017? This is Ashlie with my fifth thought. This morning I am waking up thinking about our incredible production team at the 1000 islands playhouse. We had a production meeting over lunch yesterday and I was looking at each member of the team, thinking about how diligent, patient talented and hardworking they all are. I feel really lucky to be working with this group of people and it really brings to mind how much of theatre is a team effort and how many different kinds of talents it takes to put on a show. This is Ashlie Corcoran with my sixth thought. My thought this morning is simply if you haven’t watched the James Corden’s Broadway Karaoke I encourage you to do that. I just watched it this morning and I have to say it is so delightful and even though there are 5 big stars in that car driving around downtown New York City, you also see 5 goofy, talented, very funny theatre people. And, Ya! It has put a bit of a spring in my step this morning as I head off to rehearsal. This is Ashlie and my seventh thought. This morning I am thinking about what happened in Orlando and while I don’t believe that I have a unique perspective to add in this 30-second thought I did want to say how deeply saddened and angered I am by the entire situation. This is Ashlie Corcoran’s eighth thought. What I am learning about today is that during tech I am bad about being preoccupied with thoughts. We are in tech for Blithe Spirit so it’s all about making a lot of decisions in the timeliest of manners because our tech week is so tight at the Thousands Islands Playhouse. And as such I forgot to do my thought This morning and so I apologize. This is Ashlie with my ninth thought. This morning I am thinking about and being grateful for all of the people in my life who support me and take care of me especially at such busy times like tech week. A couple of nights ago I came home and my roommate who is one of the actresses in the show had harvested some rhubarb from my back yard and had made two pies. I am proud to announce that I ate an entire pie in about two days. And – yeah – Krista Colosimo is the best. This is Ashlie with my eleventh thought. I spent this morning driving from Gananoque to Toronto to attend a workshop of our final production of the season: You Are Here. And in the car with me was my dear friend and colleague, Jason Hall, who is a playwright and director, and we talked about everything from art to politics to our personal lives. It made me realize how lucky I am to have people like that in my life. Hard to sum up our conversation in 30 seconds. But important to have people who you can these big deep conversations with, sometimes agree with sometimes disagree with. And I feel very fortunate. This is Ashlie and my twelfth thought. Today I am thinking about patience. Out of all the virtues this is the one that I have tried the most to cultivate in my life both personally and professionally. I really actually also mean how to develop patience for myself. It is obviously easy to be patient when things are going well but when things are tougher where does this patience come from? Something that I am working on every day. This is Ashlie and my thirteenth thought. On Monday evening I was at the Dora Mavor Moore awards. And this has led me to think a lot about community. Even though I now live in Gananoque, 3 hours up the 401, I no longer reside full time in Toronto, I still very much part of that community and feel very, very grateful for that. This is Ashlie with fifteenth thought. Happy Canada Day everyone. It has been a real pleasure doing this thought residency and I am so grateful for the opportunity, it has taught me a lot about myself. Mostly about how I feel, um, like I go from one problem or idea or solution or thought very quickly to the next, and so I have learned that I am not always great at recording them, and putting my thoughts out into the world. But it is something that I have had a lot of fun doing and I am very, very again grateful for the opportunity. 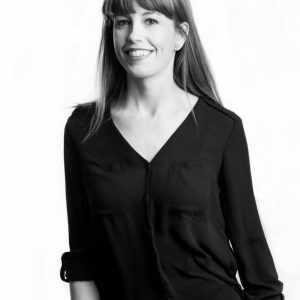 ASHLIE CORCORAN is the Artistic Producer of Toronto’s Theatre Smash, directing six productions including the critically acclaimed The Ugly One, which received a Dora Award for Outstanding Production and a nomination for Outstanding Direction. Ashlie is also the Artistic Director of the Thousand Islands Playhouse where she has directed thirteen productions. She has also directed for Tarragon, the COC and Opera Philadelphia. Upcoming: The Magic Flute (COC), Kiss (Theatre Smash/ARC/Canadian Stage), Blithe Spirit (TIP & WCT), Into the Woods (TIP).